There are billions of webpages on the internet. Thank you for clicking on mine. I've had this website for years and I used to use it to collect a load of nonsense about giraffes and a made-up fact about post codes. The internet has moved on a lot since then, and seeing as I'm not in to data harvesting or Bitcoin scams I feel a bit left out by the whole thing. So I started 2019 by clearing out the worst of my nonsense, leaving behind mostly pictures of signs which amuse me. TUI advert 'able to survive a nuclear apocalypse' Date: March 2018That bloody TUI advert is able to survive a nuclear apocalypse, the travel agent has revealed. 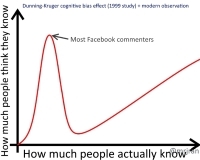 How Facebook comments workDate: May 2016The Dunning–Kruger cognitive bias effect is demonstrated perfectly in the Facebook comments section (spotted during the EU referendum campaign). 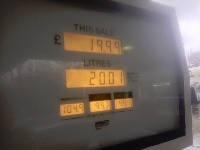 Petrol Pump ConspiracyDate: January 2016Inanimate objects often conspire against me. I will never forget my first forced use of pay-at-pump technology at an Asda just outside Stoke-on-Trent on a cold and lonely night. This was the worst possible outcome. I can't even cope with the TV on an odd number. Never mind your garden, I'd take away your houseDate: July 2018An unwelcome foray into opinion blogging sees me ranting about people who live in cities and complain about them getting bigger. "Not familiar with escalators"Date: February 2018Connolly station has a very specific sign for its vintage audience. Who's going to tell them?Date: September 2016Signs are not permitted in this area. 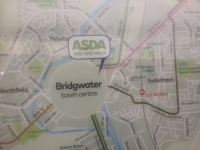 This map could not have helped me lessDate: March 2016When I got lost in Bridgwater I knew where I wanted to end up, but didn't know which way to turn. This map could not have been any less helpful. 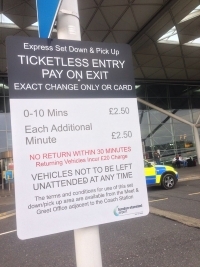 The most expensive car park in the worldDate: October 2015When my friend was looking for someone to meet him at Stansted, I had to pretend I don't get really excited in airports. Instead I found the most expensive car park in the world. 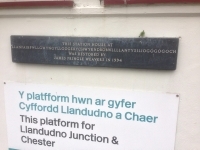 I Think I'm In WalesDate: August 2015This is my favourite Facebook check-in I've ever done. For the next few hours, everyone's phones were broken by the horizontal stretch on the location bar. That's proper trolling. Philosophical RoadworksDate: July 2015When I was on the A40, in a stationary queue caused by new road signs being erected, I found that the signs suddenly started speaking to me. 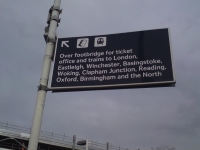 Southern Train StationsDate: October 2014Nowhere beyond Birmingham is worth mentioning. It's cold and dark, with border controls you'll struggle to pass. This isn't actually true: the boundary is at Banbury. The world's worst tour bookDate: January 2014I love old maps and books; you never know what you're going to find. Like this. I have no idea why this would be produced, or why it deserves such a bold print. 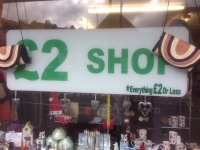 Inflation Bites In WalesDate: October 2013We're all aware of pound shops and 99p stores. Well in Wales, economic advantages put them a higher class than that. 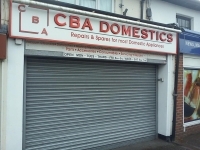 Some ironic shop spot shotsDate: August 2012I-rony. Stop the salt!Date: December 2010Unlike most people, I happily take orders from electronic signs. 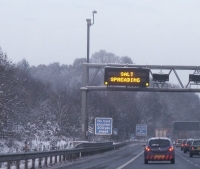 When the template message "GRITTING IN PROGRESS" was first changed to "SALT SPREADING", a predictable message became much more intimidating. 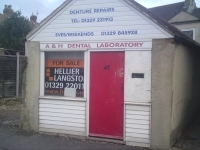 My dental laboratoryDate: November 2010It is really, absolutely, not a shed. My Printer Hates MeDate: November 2010Anyone who has worked in a supposed 'modern office' will be familiar with the unnecessary evil that is printing credit. Printing credit hates you. This is proof of that in action. The one about the blogger and the hotelDate: January 2018This news story is annoying me because everybody is wrong. 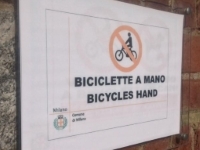 Bicycle HandDate: February 2016This translation really does not help. The aggressiveness of the German languageDate: February 2016I love this translation. If I were a rich manDate: February 2016For me though the charity of choice is a simple one. Having spent many afternoons stuck in stationary traffic on the M6 in the West Midlands, I read with delight this week that the M6 Toll motorway is going up for sale. If I were rich enough, I'd buy the road like a shot. 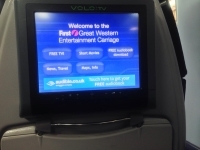 What is an entertainment carriage?Date: November 2014I had a bit of a shock when I sat down on this First Great Western/Great Western Railway train. It had an entertainment carriage. With films on it! Like from planes in the future. This forecourt is not dedicated to the publicDate: May 2014Are you dedicated to the public? 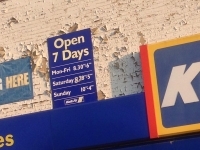 Sadly this sign isn't. Precise Opening hoursDate: May 2014Why open on the hour or on the half-hour when you can open at the precise minute? 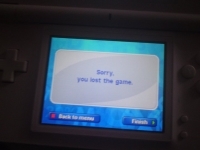 I lost the gameDate: May 2011Nintendo DS made me lose the game. Please don't hate me for this. Boscombe's £3m artificial surf reefDate: March 2011In 2011 I was lucky enough to visit Boscombe, which had just invested £3m in an artificial surf reef to create large waves to attract surfers. The result was perhaps not what they were expecting.